Karlyuk caves are located on the western slope of the ridge Kugitang-Tau, on the eastern outskirt of Turkmenistan. There are numerous picturesque gorges on the slopes of the ridge. The height of some cliffs is 200 m.
There were registered about 60 caves, its length is from a few hundred meters to several kilometers. Karlyuk village is the great value as a natural biological attraction, as well as a world heritage monument. The most famous caves are Hoshmoyuk, Kapkutan, Stone Flower, Vertical (Cave of the Dead), located in the 7-10 km. to the east of the Carluke village. Cave "Hashimeyuk" is geological and archeological site in a mountain system of Kugitang. The length of the cave is 3.5 km and consists of many mazes (from 5 to 8 metres). There are a lot of formations, which are called stalactites and stalagmites. The length of “Kop-Kotan” cave is 27 km, the depth of 56 m. The uniqueness of this cave is that there are underground voids: "Hall of Santa Claus and Snow Maiden", "Hall of jellyfish", "Hall of fairy tales" and others. It takes the third place on minerals. Karakul cave consists of several grottos. 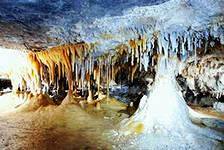 Stalactite is the largest cave (190 m in length and 10 m in height). The air temperature is 20 °. "Geophysical" cave was discovered in 1985 by members of the Kugitang geological expedition. According to experts, it is the most beautiful caves of Kugitang. The cave is on the list of UNESCO as a unique natural geological object. Having been in Turkmenistan, be sure to visit these unique places. Excursion and educational trail runs from April to November. Turkmenistan is famous for many caves, but the most beautiful ones are Karlyuk cave.